Gourmet microwave popcorn bags with your logo/design. 3.5 ounce bags filled with gourmet butter flavored popcorn. Template :this is the template used for all custom imprinted bags. The net weight and ingredients must be on the bag. The net weight may be moved if it interferes with your design, but it must remain on the main print area. The grey susceptor plate is made into the bag and it cannot be removed. This plate is necessary in order for the popcorn to pop correctly. Size : 3.5 oz. Shipping Weight : 27lbs/100 Packaging : Bulk. 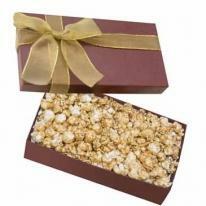 Gourmet microwave popcorn bags with your logo/design. 3.5 Ounce bags filled with gourmet butter flavored popcorn. For a one color (pre-designed bag) your logo must be the same color as the bag design. Size : 3.5 oz. Shipping Weight : 27lbs/100 Packaging : Bulk. 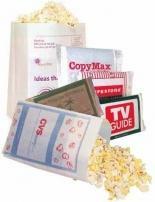 Gourmet microwave popcorn bags with your logo/design. 3.5 Ounce bags filled with gourmet butter flavored popcorn. Custom printing not available - specify design. Size : 3.5 oz. Shipping Weight : 27lbs/100 Packaging : Bulk. 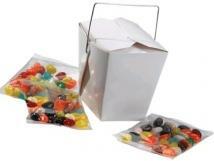 The Ultimate custom designed microwave bag at the best quality and lowest pricing in the promotional industry. Delicious Gourmet Butter Flavor ! Choose From White or Kraft Bags! Custom Plate Fee includes 1 color Imprint. One Year Shelf Life. Product Weight: 3.5 Ounces Each. 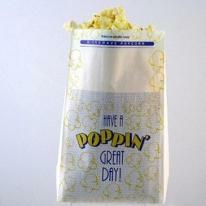 Stock design microwave popcorn with a one standard color imprint on one panel of the bag. The bag is individually cello wrapped. The setup charge is $50.00 per color. At 25,000 and above, the production time is 4 weeks longer. Microwave bag is individually cello wrapped and imprinted with popping instructions and ingredients on the reverse side. Imprint Area: 3 1/2"W x 2"H.
Highlights Compare and save. 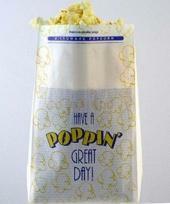 This microwave popcorn bag comes printed with a 4-color process laminated decal. DIMENSIONS 6" W x 4" H DECAL SIZE 5.5" W x 3.5" H STANDARD PRODUCTION 7-10 days. Rush service available. Please call for details. SHIPPING WEIGHT 200 carton / 50 lbs. 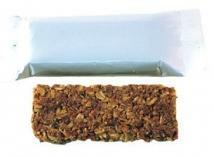 Oats and honey granola bar in clear or white cello. Imprint Area: 3 1/2"W X 1 5/8"H.
Cajun Hot Sauce - 3 oz. Custom Cajun Hot sauce (3 oz. glass bottle) with a white label with a standard color imprint. The bottle is sealed with a shrink band. For a gold or silver label, add $.15. Imprint Area: Label Size: 3 1/4"L x 2 5/8"H.
Cajun Hot Sauce - 6 oz. Custom Cajun Hot sauce (6 oz. glass bottle) with a white label with a standard color imprint. The bottle is sealed with a shrink band. For a gold or silver label, add $.15. Imprint Area: Label Size: 3 1/4"L x 2 5/8"H.
Stock design microwave popcorn bag with a four color process imprint on one panel. Microwave bag is individually cello wrapped and imprinted with popping instructions and ingredients on the reverse side. Imprint Area: 3 1/2"W x 2"H.
Business card box with gourmet fills. Choice of A, B, or C Fills. Bulk Packaging. Size: 4 1/4" W x 3 3/8" H x 5/8" D. Max Imprint Area: 3" W x 2" H. WT_100: 19 LBS. Paper-Proof: $10. (Required on all labels). Chinese takeout box. With three 1oz. BB bags inside Bulk packed Factory is not responsible for M&M breakage. Size: 3 1/8'' W x 2'' H. Max Imprint Area: 1 5/8'' W x 1 1/2'' H. WT_100: 28 LBS. Paper-Proof: $10. (Required on all labels). 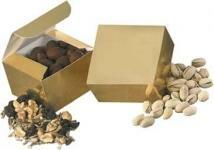 These custom printed Ballotin box with gourmet fills will keep your name with in reach of their finger tips. Bulk packaging. Size: 3 3/8" W x 3 1/4" H x 2" D. Max Imprint Area: 3 3/8" W x 3 1/4" H x 2" D. WT_100: 71 LBS. Paper-Proof: $10. (Required on all labels). 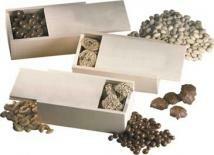 These custom printed large ballotin box with gourmet fills will keep your name with in reach of their finger tips. Bulk packaging. Size: 6 7/8" W x 2" H x 3 3/8" D. Max Imprint Area: 5 1/2" W x 2 1/4" H. WT_100: 132 LBS. Paper-Proof: $10. (Required on all labels). A classic gift, sure to make them remember your name. Guaranteed to make a lasting impression. 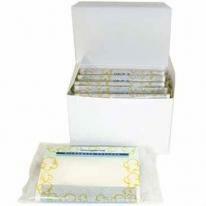 Gold Box Ribbon imprint available in Gold or Silver. Bulk packaging. See warm weather shipment information. Size: 3 3/4" W x 2 1/4" H x 3 3/4" D. Max Imprint Area: 5" W x 7/8" H. WT_100: 87 LBS. Paper-Proof: $10. (Required on all labels). These designer plastic trays feature four different types of gourmet treats to be enjoyed separately, or combined in a Tower of Pleasure. The Tower of Pleasure is all four trays shrink wrapped together with a greeting card. Each tray is individually decorated. "Each four tier tray tower of pleasure is delivered with a beautiful greeting card. Choose from our designs of customize your own card." Made in America. Dimensions: 2" H x 7" D.
These festive baskets are a sure way to keep your name in plain view and will make a lasting impression. Stuff them with your favorite fills. Ribbon is customized with your name. Ribbon imprint available in Gold or Silver. Bulk packaging. Size: 7" W x 3 1/2" H x 2" D. Max Imprint Area: 5" W x 7/8" H. WT_100: 149 LBS. Paper-Proof: $10. (Required on all labels). This classic box is the masterpiece you have been looking for! 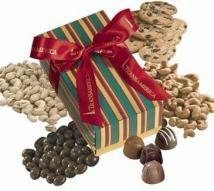 It is filled with many combinations of our famous gourmet treats. Each box comes with a hot stamp of your logo on the lid and ribbon that adds the perfect finishing touch. Made In America. Ribbon Colors: Gold, Silver, Black, Red, White, Blue. 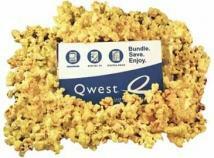 Dimensions: 2" H x 8"W x 4" D.
Custom 5 pack of stock design microwave popcorn (one standard color imprint on each bag). The white box, with a one standard color imprint, is sealed with a safety seal. Imprint Area: MWP: 3 1/2"L x 2"H / BOX: 5"W X 3"H Filled Carton: 17" x 17" x 9 1/4" Quantity Per Carton Filled: 20 Carton Shipping Weight Filled: 27. 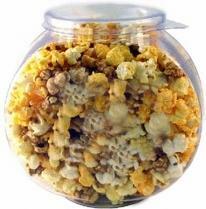 Half gallon fishbowl candy container filled with Butter Popcorn. Imprint Area: 3 1/2"W x 3 1/2"H Products Size: 7"W x 6 3/4"H.
A classic favorite to keep your name or message around long after the goodies are gone. 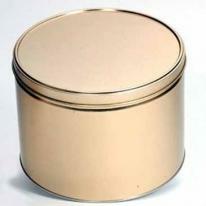 Fill these striking Gourmet Tins with the item of your choice. Bulk packaging. Also available with attractive season-themed 4 color process backgrounds. Size: 6" W X 1 11/16"H Max Imprint Area: 4" W x 4"H (Spot), 6"D (4 Color) WT_100: 82 LBS. Paper-Proof: $10. (Required on all labels). 20:10. 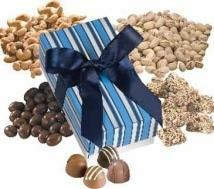 Our Classic Single Gift Box is filled with your choice of our favorite delicacies. Each box comes with a hot stamp of your logo on the lid. Made in America. Dimensions: 2" H x 4" W x 4" D.
Half gallon fishbowl candy container filled with Salted Pretzels. Imprint Area: 3 1/2"W x 3 1/2"H Products Size: 7"W x 6 3/4"H.
This is a thoughtful and impressive way to say Thank You! 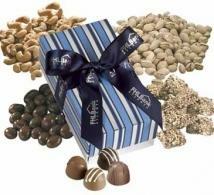 Our Chairman Gift Box is packed with many combinations of our famous gourmet treats. Each box comes with a hot stamp of your logo on the lid and ribbon that adds the perfect finishing touch. Made In America. Ribbon Colors: Gold, Silver, Black, Red, White, Blue. 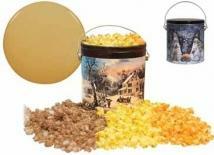 Dimensions: 2" H x 8" W x 8" D.
1/2 Gallon Tin filled with Butter Popcorn Filled tins are tape sealed and include a mailer. Fresh popped caramel corn in a large plastic jar (6"D x 7 1/2"H) with a white label with a one to 4 color process label. The jar is sealed with a shrink band. Imprint Area: 3.5"W X 2"H Note: Price shown is for container only, call for fill options and pricing. Filled Carton: 20" x 20" x 16" Quantity Per Carton Filled: 18 Carton Shipping Weight Filled: 26. A classic gift, sure to make them remember your name. Guaranteed to make a lasting impression. Boxes available in Gold. Ribbon imprint available in Gold or Silver. Bulk packaging. See warm weather shipment information. Size: 7 1/4" W x 2 1/4" H x 3 3/4" D. Max Imprint Area: 5" W x 7/8" H. WT_100: 47 LBS. Paper-Proof: $10. (Required on all labels). Gift box with custom ribbon. Ribbon size is 1 1/2". Ribbon imprint colors available in Gold and Silver. Bulk packaging. Size: 7 1/4" W x 3 3/4" H. Max Imprint Area: 5" W x 7/8" H. WT_100: 80 LBS. Paper-Proof: $10. (Required on all labels). Gift box with custom ribbon. Ribbon size is 1 1/2". Ribbon imprint colors available in Gold and Silver. Bulk packaging. Size: 7 1/4" W x 3 3/4" H. Max Imprint Area: 5" W x 7/8" H. WT_100: 94 LBS. Paper-Proof: $10. (Required on all labels). 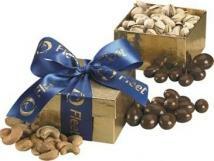 Our rectangle tin is offered in silver or gold and is generously filled with our classic gourmet treats. Each tin comes with a one color screen imprint on the lid, or a four-color process laminated decal. Made in America. Dimensions: 4-1/4" H x 8" W x 2" D.
Give a gift that's guaranteed to have gigantic appeal. 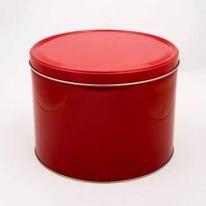 Our generous Gallon Sized Tins may be filled with your choice of Popcorn, Pretzels, or Chocolate Chip Cookies. Also available unfilled. Also available with attractive season-themed 4 color process backgrounds. Size: 6 3/4" W x 7 1/4" H Max Imprint Area: 6 1/2" W x 5" H WT_100: 180 LBS. Paper-Proof: $10. (Required on all labels). 20:10. 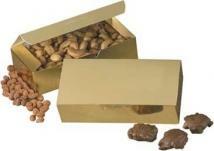 Custom imprint wooden box with choice of gourmet fills for long term name recognition. Also available empty. Bulk packaging. Size: 7 7/8" W x 2 3/4" H x 4 1/4" D. Max Imprint Area: 6" W x 2 1/4" H. WT_100: 210 LBS. Paper-Proof: $10. (Required on all labels). 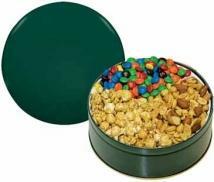 The one gallon tin with handle is filled with freshly popped corn in three exceptional flavors; Caramel, Butter and Cheese. Popcorn is bagged inside to maintain freshness and does not ship loose like the picture. Price includes one color direct imprint. There are four tin design choices: Penguins, Whimsical Snowmen, Winter Sleigh Ride, and Beautiful Ornaments. Made in America. Dimensions: 7" H x 6-1/2" D.
DISCONTINUED: Gift box with custom ribbon. Ribbon size is 1 1/2\". Ribbon imprint colors available in Gold and Silver. See warm weather shipment information. Your choice of A, B or C fills. (A=JY9821 & C=JY9823). Note: Pricing shown is for B fills. Other fills available, please call for details and pricing. B Fills: Gummy Bears, Gummy Worms, Runts, Pistachios Swedish Fish, Sour Patch Kids, Sunflower Seeds In Shell Teenie Beanies, Trail Mix, Super-mints, Conversation Hearts, Gumballs, Candy Corn, Chocolate Covered Peanuts, Chocolate Covered Raisins, Chocolate Chip Cookies. Ribbon Imprinting: (One color imprint, Gold or Silver) Set-up charge $45. Re-order set-up charge $20. No less than minimum. Absolute Minimum Order Quantity: 50. Item Size: 7 1/4\" W x 3 3/4\" H Max Imprint Area: 5\" W x 7/8\" H Wt_100: 94 lbs. Packaging: Bulk packaging. The king size tin features two delicious blends of our freshly popped popcorn; Butter and Caramel. 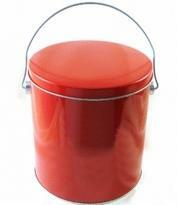 You can add a 4-color process laminated decal on the solid tins for $.75. Made in America. Dimensions: 3" H x 8-1/8" D.
Give a gift that's guaranteed to have gigantic appeal. Our generous Gallon Sized Tins may be filled with your choice of Popcorn, Pretzels, or Chocolate Chip Cookies. Also available unfilled. Also available with attractive season-themed 4 color process backgrounds. Size: 6 3/4" W x 7 1/4" H Max Imprint Area: 6 1/2" W x 5" H WT_100: 00 LBS. Paper-Proof: $10. (Required on all labels). 20:10. 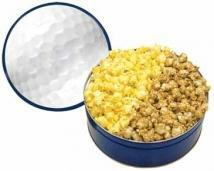 Fresh popped butter popcorn (with a resealable inner bag) in a custom tin with a one standard color imprint on the lid (tape sealed and in mailer). Ship only by truck unless individually drop shipped. 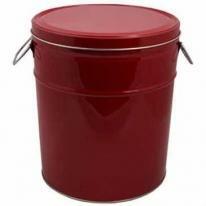 Imprint Area: Lid: 6 1/2"D / Body: 4 3/4" x 23.5" Note: Price shown is for container only, call for fill options and pricing. Filled Carton: 10 1/8" x 10 1/8" x 7 3/8" Quantity Per Carton Filled: 1 Carton Shipping Weight Filled: 4. 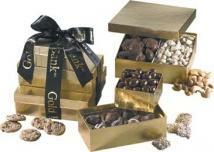 Gold gift box with gourmet fills. Custom ribbon 16oz stainless travel mug Travel mug Bulk packaging. Size: 7 1/4" W x 5" H x 7" D. Max Imprint Area: 5" W x 7/8" H. WT_100: 160 LBS. Paper-Proof: $10. (Required on all labels). Note: Other charges apply for other imprint. 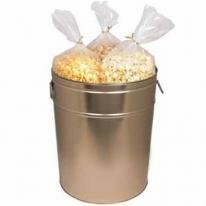 Go with a nibbly promotional classic and give in style with this 1 gallon popcorn tin. 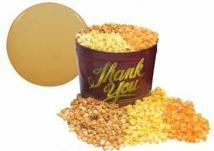 Enjoy fresh popped butter popcorn with an imprinted keepsake tin. Add your one color imprint on the side and/or a full color imprint on the lid for maximum exposure on a 6 5/8"D x 7 1/4"H tin. This promotional classic is perfect for holiday gifts, milestone award packs, visiting client appreciation gestures and so much more. 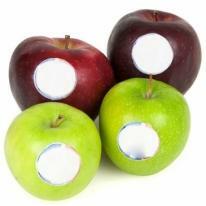 Add your brand to one or both imprint areas and create promotional snack that any recipient will appreciate. 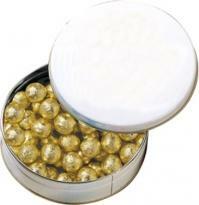 Tin is available in gold, silver, red & white. Tins ship only by truck unless individually drop shipped. 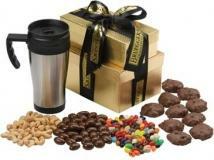 Size : 6 5/8"D x 7 1/4"H Imprint Area: lid - 5 1/4"D; body - 6"W x 3 3/4"H.
Gift box with custom ribbon. Ribbon size is 1 1/2". Ribbon imprint colors available in Gold and Silver. See warm weather shipment information. Your choice of A, B or C fills. (A=JY9821 & B=JY9822). Note: Pricing shown is for C fills. Other fills available, please call for details and pricing. C Fills: Pecan Turtles, Truffles, Chocolate Coins, Hershey Kisses, English Butter Toffee, Chocolate Coveted Almonds, Chocolate Covered Pretzels, jelly Bellies, M&M's, Earth Balls, Easter Eggs, Halloween Balls, Red Foil Chocolate Hearts, Chocolate Balls, Sports Balls, American Flag Balls, Cashews, Foil Wrapped Chocolate Squares, Christmas Balls. Ribbon Imprinting: (One color imprint, Gold or Silver) Set-up charge $45. Re-order set-up charge $20. No less than minimum. Absolute Minimum Order Quantity: 50. Item Size: 7 1/4" W x 3 3/4" H Max Imprint Area: 5" W x 7/8" H Wt_100: 94 lbs. Packaging: Bulk packaging. Fresh popped 3 way popcorn (butter, cheddar cheese and white cheddar cheese - with inner bags by flavor) in a tin with a one standard color imprint on the lid in a mailer. Ship only by truck unless individually drop shipped. 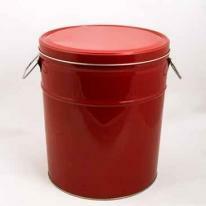 Imprint Area: Lid: 6 1/2"D / Body: 4 3/4" x 23.5" Note: Price shown is for container only, call for fill options and pricing. Filled Carton: 10 1/8" x 10 1/8" x 7 3/8" Quantity Per Carton Filled: 1 Carton Shipping Weight Filled: 4. Give a gift that's guaranteed to have gigantic appeal. 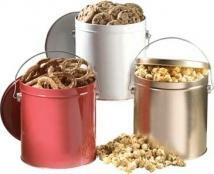 Our generous Gallon Sized Tins may be filled with your choice of Popcorn, Pretzels, or Chocolate Chip Cookies. Also available unfilled. Also available with attractive season-themed 4 color process backgrounds. Size: 6 3/4" W x 7 1/4" H Max Imprint Area: 6 1/2" W x 5" H WT_100: 300 LBS. Paper-Proof: $10. (Required on all labels). 20:10. 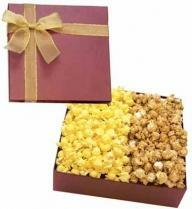 Fresh popped 3 way popcorn (butter, cheese, and caramel - with inner bags by flavor) in a custom tin with a one standard color imprint on the lid (tape sealed and in mailer). Ship only by truck unless individually drop shipped. 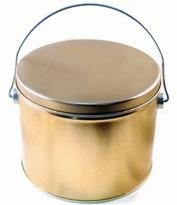 Imprint Area: Lid: 6 1/2"D / Body: 4 3/4" x 23.5" Note: Price shown is for container only, call for fill options and pricing. Filled Carton: 10 1/8" x 10 1/8" x 7 3/8" Quantity Per Carton Filled: 1 Carton Shipping Weight Filled: 5. The two gallon tin is filled with freshly popped corn in either two or three exceptional flavors; Caramel, Butter and Cheese. There are six solid color tins as well as three designer choices. 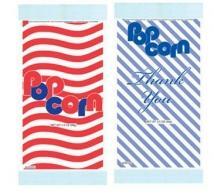 Each designer popcorn tin is delivered with a beautiful greeting card. Choose from our designs or customize your own card." Made in America. Dimensions: 8" H x 10-1/4" D.
The Royal tin choices feature a plentiful amount of our most popular gourmet treats to satisfy your biggest critics. You can add a 4-color process laminated decal on the solid tins for $.75. The designer tins come with a greeting card. Solid tin colors, designer tin choices and greeting cards are in the pictures. Made in America. Choose a Stock Design or Design your own Greeting Card. Thank You, Bow, Snowflake. Dimensions: 2-5/8" H x 7-3/16" D. Greeting Card Size: 3-1/2" x 5-1/4". 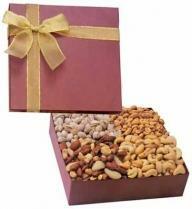 Divided gift box with gourmet fills and customized ribbon. Boxes available in Gold. Ribbon imprint available in Gold or Silver. Bulk packaging. See warm weather shipment information. Size: 7 1/4" W x 2 3/8" H x 7 1/4" D. Max Imprint Area: 5" W x 7/8" H. WT_100: 177 LBS. Paper-Proof: $10. (Required on all labels). 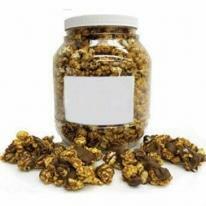 Fresh popped chocolate drizzled caramel corn in a large plastic jar (6"D x 7 1/2"H) with a white label with a one to 4 color process label. The jar is sealed with a shrink band. Imprint Area: 3.5"W X 2"H Note: Price shown is for container only, call for fill options and pricing. Filled Carton: 20" x 20" x 16" Quantity Per Carton Filled: 18 Carton Shipping Weight Filled: 32. 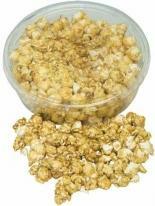 The two gallon tin is filled with freshly popped corn in three exceptional flavors; Caramel, Butter and Cheese. Popcorn is bagged inside to maintain freshness and does not ship loose like the picture Add a greeting card $3.00 Made in America. 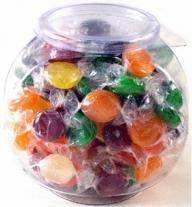 Dimensions: 8" H x 10-1/4" D.
Fresh popped chocolate drizzled caramel corn with treats in a large plastic jar (6"D x 7 1/2"H) with a one to 4 color process label. The jar is sealed with a shrink band. Choice of: toffee, peanuts or Reese's Pieces. Imprint Area: 3.5"W X 2"H Note: Price shown is for container only, call for fill options and pricing. Filled Carton: 20" x 20" x 16" Quantity Per Carton Filled: 18 Carton Shipping Weight Filled: 37. Fresh popped 3 way popcorn (butter, cheese, and caramel - with inner bags, by flavor) in a custom tin with a one standard color imprint on the lid (tape sealed and in mailer). Ship only by truck unless individually drop shipped. Imprint Area: BODY: 7"L x 5"H / LID: 5 1/4"D Note: Price shown is for container only, call for fill options and pricing. Filled Carton: 10 1/2" x 10 1/2" x 11 5/8" Quantity Per Carton Filled: 1 Carton Shipping Weight Filled: 6. 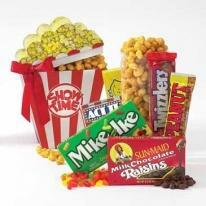 Grab your popcorn from this amusing keepsake gift box filled with all of your showtime favorites. Includes Mike & Ike s, Sun-Maid chocolate covered raisins, Lemon heads, Twizzlers, peanut brittle bar, caramel corn crunch and microwave popcorn. Imprinted ribbon and gift cards available at additional cost and min. of 12. Dimensions: 7.5"L x 5.5"W x 10"H Shipping weight: 3 lbs. Fresh popped 3 way popcorn (butter, cheddar cheese and white cheddar cheese - with inner bags by flavor) in a tin with a one standard color imprint on the lid in a mailer. Ship only by truck unless individually drop shipped. Imprint Area: Body: 10 1/2"W x 8"H / Lid: 7 D Note: Price shown is for container only, call for fill options and pricing. Filled Carton: 12 3/8" x 12 3/8" x 15 1/16" Quantity Per Carton Filled: 1 Carton Shipping Weight Filled: 7. A classic gift, sure to make them remember your name. Guaranteed to make a lasting impression. Stacked gift boxes with any gourmet fills and customized ribbon. Boxes available in Gold. Bulk packaging. Size: 7 1/4" W x 7" H x 7 1/4" D. Max Imprint Area: 5" W x 7/8" H. WT_100: 487 LBS. Paper-Proof: $10. (Required on all labels). 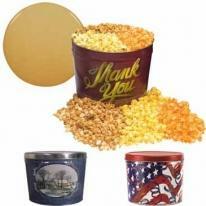 Fresh popped 3 way popcorn (butter, cheese, and caramel - with inner bags, by flavor) in a custom tin with a one standard color imprint on the lid (tape sealed and in mailer). Ship only by truck unless individually drop shipped. Imprint Area: Body: 10 1/2"W x 8"H / Lid: 7"D Note: Price shown is for container only, call for fill options and pricing. Filled Carton: 12 3/8" x 12 3/8" x 15 1/16" Quantity Per Carton Filled: 1 Carton Shipping Weight Filled: 9.